I kind of pride myself on being able to make a peasant soup out of the groceries that are left at the end of the week. Just a few days ago I turned some cans of beans into dinner, and no one went hungry. This French Peasant Soup recipe is perhaps my favorite version of turning the vegetables in the fridge into dinner. I make it often in autumn and winter, but it is almost never the same. 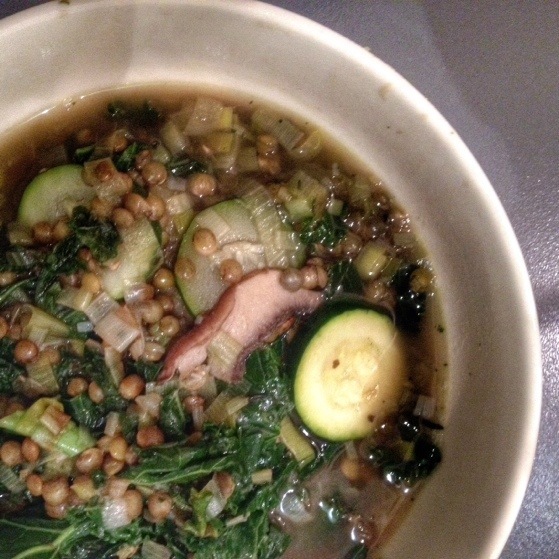 If I have garbonzo beans, a green vegetable and tomatoes, I call it Italian Peasant Soup and serve it with a spoonful of pasta, but this version with leeks and French lentils feels like what I would make if we lived in Provence. Not that we ever have, but if you add Herbes de Provence to something, it becomes French, oui? Mainly what I’m saying is that you don’t have to trouble yourself about having the exact vegetables for this recipe, or even the exact kind of legume, although I am partial to French lentils and the way they don’t turn to mush like brown ones. You can make a version of this soup out of whatever is in your cupboard. You can use cans of cannelloni beans or frozen squash if you want. 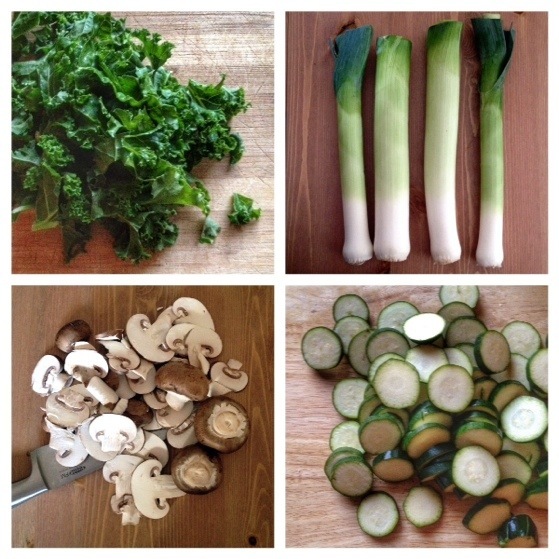 Substitute spinach for kale or onions in place of leeks. Just pour in the broth and call it dinner. Add homemade bread, and all of a sudden your peasant dinner is fit for a vegetarian king. In your heavy bottomed pot, Dutch oven or Le Crueset, pour in the olive oil and bring to medium heat. Add the leeks and garlic. Cook for about five minutes. 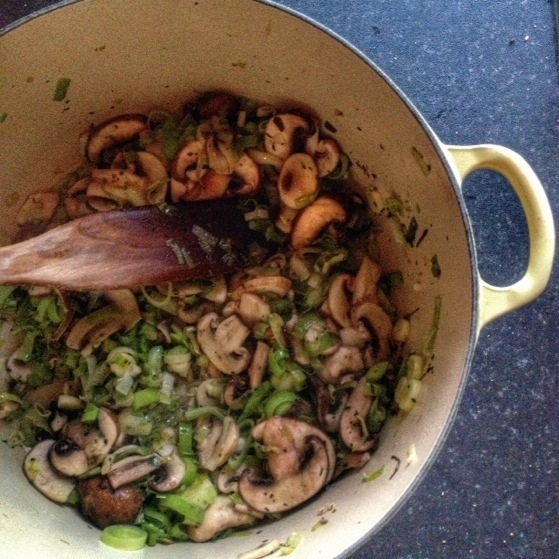 Add mushrooms, thyme and herbes de provence. Cook about 10 more minutes until vegetables are soft. Add stock and bring to a simmer. 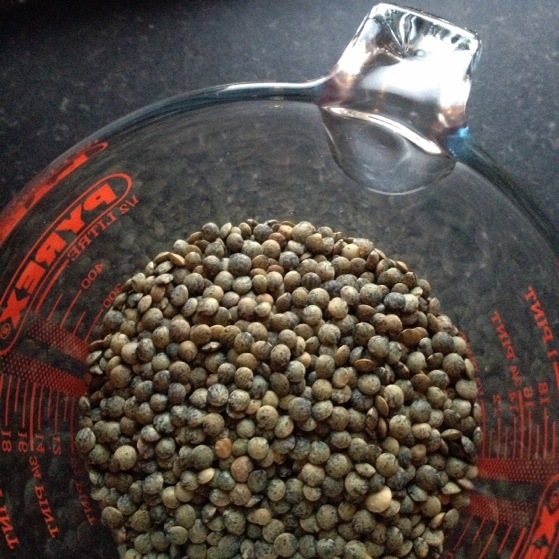 Pour in lentils and cook for about 30 minutes or until lentils are done. Add zucchini/courgettes and Kale leaves. Cook about ten more minutes. Salt and pepper to taste. Serve warm with hearty bread or over pasta (kid-friendly option). 😉 Happy Soup Season, Debbie! I know you are cooking up some good ones on your blog as well!